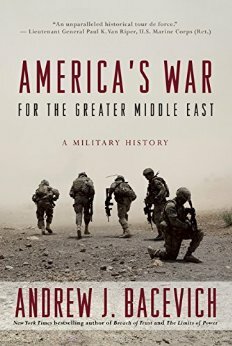 America’s War for the Greater Middle East – A military history. Andrew J. Bacevich. Random House, New York, 2016. However it is not one of his better works, and perhaps that is because of the narrowness of focus and the resulting tie ins that could have been made and that without do not provide a perspective of this war amongst all the other wars instigated by the U.S. I had to keep reminding myself that this is a “military” history, focussed on the Middle East, which kept reminding myself about the missing links. Another significant omission, and this is surprising considering how the first chapter started with a description of the importance of oil to the American way of life, is how since those same Nixon/Carter years the US$ has been the global fiat currency backed mainly by its use as the reserve currency for all global oil transactions – now a fading proposition, another reason to create chaos. It is implied at the outset, but is never discussed as the GME War continues its depredations in the region and its blowback consequences within the United States (yes, I remind myself, this is a military history but…. ).